Holy objects, because of their ability to awaken the positive potential in everyone, are certainly precious and wish-fulfilling. This page, a supplement to the April-June 2010 issue of Mandala, is designed to point you in the direction of more extensive information about holy objects. Lama Zopa Rinpoche has created a practice that can be used in conjunction with holy objects to help lead our animal friends to a happier future. Lama Yeshe gave a series of talks about Maitreya Buddha and instructions on the yoga method of Maitreya in 1981 at Maitreya Instituut in the Netherlands. UniversalLove is a beautiful collection of these teachings dedicated to cultivating loving kindness and tender heart. The Lama Yeshe Wisdom Archive, the publisher of the book, offers a discount for direct orders and has generously provided the first three chapters for free in PDF format. The Preliminary Practice of Tsa-Tsas contains the meditation practices associated with tsa-tsa casting and even includes practical advice about how to choose materials and where to acquire high-quality molds. Sutras are considered utterances of the Buddha are highly venerated in the Buddhist tradition. Lama Zopa Rinpoche, FPMT’s spiritual director, recommends in particular that students engage with the Sutra of Golden Light, the Sanghata Sutra and the Vajra Cutter Sutra. The Sutra of Golden Light is recommended by Lama Zopa Rinpoche particularly for world peace and for protection. Filled with amazing encounters between the Buddha and other powerful non-human beings, this sutra is particularly known for the inclusion of moving stories about the Buddha as a bodhisattva and the sacrifices he made to help living beings. The Sanghata Sutra, re-discovered in the 1930s in the northernmost reaches of Pakistan, was first brought to Lama Zopa Rinpoche’s attention in 2002. Upon reading it, Rinpoche immediately committed to write the entire sutra by hand in gold on rainbow-colored paper to place in the 500-foot Maitreya statue being built in India, and to have it translated into many languages. These sutras can all be downloaded freely on FPMT’s website. Printed copies can be obtained through the Foundation Store for a minimal donation. 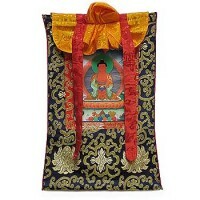 You can easily invite a statue, prayer wheel or thangka into your home. The Foundation Store takes special pains to hand select sacred art in order to make sure that what is sent out is as beautiful and perfect as what the objects themselves represent. The money generated from sacred art is carefully monitored, ensuring that profits are not used to support worldly interests and only in accordance with the guidelines of Dharma income. Over the years, Mandala has published numerous stories about holy objects and one issue in particular, November-December 2000, focused almost exclusively on the Maitreya Project, an FPMT initiative to build a 500-foot (152-meter) statue of the future Buddha, Maitreya. Visit the Mandala Archives to search for stories related to holy objects, view available articles online or purchase back issues with stories that interest you. By helping the Maitreya Project accomplish its goal to build the largest statue in the world for the benefit of all, you can receive a replica of the Maitreya statue (a holy object itself) as a gift. 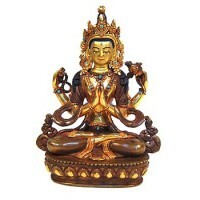 These beautiful statue are made from white resin and professionally finished in a gold-colored coating. 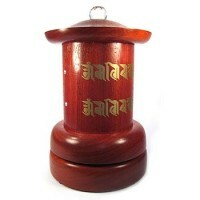 The statues are already filled with mantras and come in a red presentation box that is securely padded. FPMT’s dedication to holy objects is reflected in the creation of four separate funds managed by FPMT’s International Office: the Nagarjuna Statue Fund supports the construction of a marble Nagarjuna statue dedicated to the long life and health of Lama Zopa Rinpoche; the Stupa Fund, which supports the construction of stupas world-wide, such as the Kalachakra stupa being built at Kurukulla Center in Medford, Massachusetts, USA; the Prayer Wheel Fund, which has contributed to the large prayer wheels at Root Institute in India and Land of Medicine Buddha in California, USA. ; the Padmasambhava Project for Peace, a project to install statues of Padmasambhava around the world; and the Writing the Prajñaparamita and Sanghata Sutra Fund which supports the copying of these texts in pure gold ink for inclusion in the heart of the Maitreya Project.